Like China, it was an economic powerhouse way back when, but fell behind the West and East Asia. Even after it threw off colonialism, India grew at incredibly slow rates until 1991 when they liberalized the economy and passed tons of economic reforms. Since 1991, India has grown and changed by leaps and bounds. The only country that has grown faster is China. India is on a pretty firm course to become a major world power (if it arguably isn’t already). It’s a center for world-class corporations, software and culture. And yet – it is famously full of contradictions. It’s not following the well-trodden path of economic development paved first by Britain, then the US, then Japan and then most recently Korea and China. India is developing in a uniquely lop-sided path and is busting all the economic and political truisms declared in recent human history. 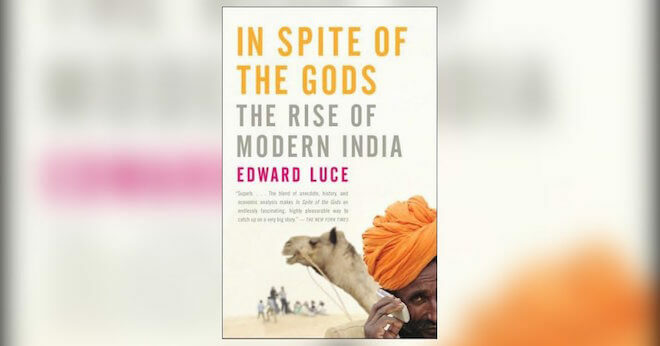 That is the topic of In Spite of The Gods: The Strange Rise of Modern India by Edward Luce (former Bureau Chief for the Financial Times). I liked the book’s focus. Luce focuses on India’s economic and political rise after 1991, and stays that way. With an exception of a chapter where he gets into the political weeds, he stays focused on that theme. The chapters and points are concise and clear. You can tell that he’s a former journalist. The pull quotes are limited, but are very enlightening. Even though it was written in 2007, it is still 90% relevant in 2014. He doesn’t get into quick-changing facts, but instead sticks to multi-decade long trends. All the updated facts that I looked up stayed on the same trend as the facts cited in the book. He doesn’t just stick to interviewing central government contacts around Delhi – he gathers sources throughout the country. For anyone who has traveled in India, you’ll know just how diverse and huge the different provinces can be – Luce is sure to communicate that throughout. The main thing I didn’t like was the section on modern Indian politics & Hindu Nationalism – the latter part of Chapter 4. It’s was a chapter necessary for some of his points about Indian politics, but it got pretty dense and in the weeds. I learned a ton, so I’ll break this up into sections. India has more people living in absolute poverty than any other country. It also has one of the largest middle classes on earth. The inequality goes beyond a simple Gini Index though. It’s like a developed country – and everything that comes with it – living within and alongside one of the poorest, underdeveloped nations on earth. 1. India embraced and maintained democracy before it developed a middle class. 2. The economy is expanding without a broad based industrial revolution. There is no progression through basic mass manufacturing up the value chain. India has bleeding edge technology sector paired with an unreformed, unproductive agricultural sector. 3. India’s politics are unusually harsh and volatile for an otherwise stable democracy. It has 24 party coalitions. It has provincial governments ranging from overtly communist to blatantly business-oriented. It has fully secular to Hindu-nationalist. It makes the US political system look positively Scandinavian. 4. The economy grows faster than any country on earth except China despite everything – the corruption, the chaos, the bureaucracy and the infrastructure. The joke in Italy is that the economy grows at night while the government is sleeping. That joke again is on hyperdrive in India. 5. India’s rise is explicitly desired – even assisted by current hegemons. Historically, a country with a giant population, advanced weapons and booming economy would be feared by the status quo hegemons. Instead, it’s being groomed by the West to become a new global power. It’s almost like Britain’s handoff to the US after World War I, which was a total anomaly even then. India’s curiously lopsided approach to development began early. At independence, 84 percent were illiterate, but higher education for a small elite received the same budget allocation as elementary education for hundreds of millions. Government investment was not broad-based across the entire population, but was instead concentrated on a small group. Instead of going for comparative advantage at independence, India went for swadeshi or “self-reliance” in everything. This approach led India to focus on everything which led to focusing on nothing. After the self-reliance approach began to fail, India’s two big development problems from to 1991 were shortage of foreign exchange and shortage of food. They solved the foreign exchange with the IT/Software industry. They solved the shortage of food with the Green Revolution. But those solutions did not create an ecosystem of side effects that would have led to broader based changes (think land reform, manufacturing, etc). Now they face a ton of new challenges – and have disparate goals with no obvious single solution to pursue. In 2007, India had 470 million in the labor force. 35 million were in formal jobs paying taxes. 21 million of those were direct employees of the government. Of the 14 million left in the formal private sector, fewer than 1 million are in software & IT. In 2005, China employed more than 100 million people in large scale manufacturing. India had less than 7 million. In Delhi there are 500,000 bicycle rickshaw drivers, but only 99,000 permitted. That leads to underground government. Those other 400,000 drivers do get “permits” via bribes. Bad rules create structural corruption, even if the individuals are trying to do the right thing. Again, it’s like every bureaucracy in the world…but on hyperdrive. There is huge scope for expanding the service sector. India gets fewer foreign tourists than Singapore or Dubai (tiny nation states with comparatively very little history, beaches, mountains or attractions). But again, faces a chicken/egg dilemma with no clear starting point. India puts value on stability over efficiency – there’s no bullets or Tiananmen Squares about to happen. If something is wrong in one part of the country, it doesn’t spread or blow up the rest. Even the worst political disasters like the Muslim massacres in Gujarat don’t rock the boat in other provinces like they might in China. “India is like a lorry with 12 wheels. If one or two puncture, it doesn’t go into the ditch. It can’t go as fast as a sports car though.” Analysts genuinely worry about a disintegration of China if the government doesn’t achieve rapid economic growth. India just keeps chugging along to the next election. To those who argue that authoritarianism leads to better growth – just look at Pakistan. Just because China is growing faster than India, doesn’t mean it’s political system is the cause. Pakistan has had authoritarian rule…and it’s worse off than India. India is concerned about losing traditions and values while still globalizing and growing. As a recent visitor to India, I definitely got this sense. I think every country has this fear, but in India it seems to go deeper. Every newspaper I read, preacher I heard, or commentator I watched made so many references to trends in America as warning signs. If India doesn’t do [corrective action] now, when we are rich we will have the same problems in American as shown by [this study/poll]. If you are interested in India or just world politics and economics, In Spite of The Gods is a highly recommended read. It’s from 2007, but will remain relevant at least for the next several years. India has been around for millenia, but it has undergone incredible changes only the past 20 years. In Spite of the Gods has some dense sections, but is overall a fantastic exploration of modern India.